The luscious hue of the peridot looks magical on any sort of jewellery. Affix them to the stately elegance of pendants and you’ll transform your look to something gracefully inspirational. The brilliance of clarity that peridots flaunt make them such a prized gemstone choice for pendants. Rich in the number of varying styles, we have just the peridot pendants you need. You’ll find uncountable stores where they sell peridot pendants in UK. What makes us so special then? Well, at TJC, you’ll be awed with the stark excellence that we have to offer. With our seemingly endless range of peridot pendant styles, we have so much to offer you. Shopping for peridot pendant online in UK will never be as much fun and you can take that to the bank! Peridots have a swathing sense of crystalline brilliance. They’re usually enough as they sit alone gently at the base of your neck. 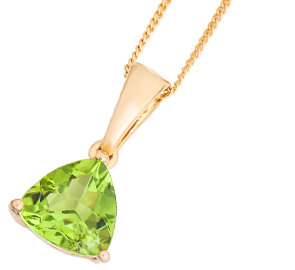 The solitaire peridot pendants in our collection have some gorgeous pieces with a scintillating glint of excellence. With multiple facets and setting that ensures maximum reflective surface, our collection also features some renditions to the basic design. The sacredness of our pendants makes it granted that we’d design halos around them. And that’s why you’ll see some stunning halo peridot pendants in our selection. Paired in the lavish company of the sparkle of a thousand, these pendants make the admirers stop in their tracks to look at you. The show-stopping gleam and glitter of the stone makes them stand out! Grasping an element of beauty within chaos, these pendants are clustered with the carpeted use of peridots. Swathing with the glittering brilliance, these adornments looks magical, with their uncontained glamour quotient. Varying in shapes and sizes, it’s a treat you cannot possibly miss. So, come and check our refined selection. It would almost seem like the beauty of peridot was drafted to be styled in the floral designs. The excellent and earthy green colour looks just right when put with the colours of flower. And you can have all of it with our floral peridot pendants. Styled in all sizes and imaginable designs, you’ll never find a collection as besotted as ours. Our bespoke pieces have the best quality of glamour and class. We have the high-grade and promising construct that makes you wear your pendant for beyond lifetimes. Find the gleaming and shining use of gold in the tinges of yellow, rose, and white (9K, 14K, 18K,) platinum (950-grade,) sterling silver, rhodium and more for their make. However, don’t let your shopping stop here. We have a lot more to offer you. Take your best picks from the endless selection of rings, earrings, necklaces, and more to complete your set. Not just in peridot, you’ll fine a swoon-worthy collection of many more gemstones.